The first song I ever heard from J. Cole is Who Dat . I hated it, still Do. It wasn't until a friend I met in class told me about a mixtape The Warm Up. With a little urging from him, I finally gave it a listen. Listening to Losing My Balance spoke to my soul. Adjusting from high school to college is usually a difficult period for most people. Today I can say Cole helped me thorough stint of transition. From then on I was hooked. I became an official fan. I spent a lot of the time afterwards listening to everything he already had out. From there I just had to wait until he dropped his next mixtape. It was November 12, 2010. Everyone,and I mean everyone in my building was talking about his next tape, Friday Night Lights. We discussed our favorite tracks, and argued about what certain tracks meant. For a few weeks it was all I listened to. This mixtape helped established my love for music. Suddenly I wanted to share my thoughts with anyone that would listen on everything music related. Later on, Cole even came to my school for our inaugural "Spring Jam." Tickets sold out immediately! In the week leading up to the concert, my friends and I listened to nothing but young simba. Whether it was either The warm up, or The Come up our rule was no listening to anything but nothing but J. Cole until the concert. Although he was opening up for Fabolous at the time, he tore the stage down performing songs like Grown Simba, Lights Please, and a special treat of In the Morning (that featured Drake) a few days before Friday Night Lights dropped. He even performed his verse on Jay-Z's Star is Born. 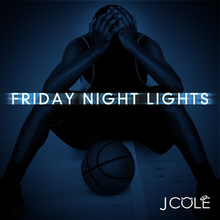 Friday Night Lights is the project what told me J, Cole was going to be a big deal. Hits included the before mentioned In the Morning, Higher, and You Got It where he battles wits with Wale. Another song I enjoyed was Villematic which uses the Devil in a New Dress beat by Kanye West. This was the mixtape of my first fall semester in college. He related to the average college student and what goes on in our daily life. Cole gave hopeless broke kids hope while being able to tell a story while doing so.